A few years back we had gone to the Havelock Islands and the resorts name was Barefoot, my elder daughter would everyday eat a chocolate mousse there and would not stop raving about it, since then she has travelled half the world but can’t stop talking about that chocolate mousse. I have time and time again tried to make all kinds of chocolate mousse but nothing absolutely nothing matches that mousse, she is never satisfied and so today also hopelessly i tried making an orange liqueur chocolate mousse she did like it, said the taste was much different but it was nothing in comparison to the Barefoot mousse. Well i am not giving up hope and one day i might find the perfect mousse recipe till then i am very happy trying all kinds and eating them. The recipe uses condensed milk, but i do feel obliged to say that no one would ever guess that this egg free mousse contained condensed milk. I for one feel condensed milk is a strangely useful ingredient, and one would find many Italian recipes using Latte condensato, but i think one comes across such recipes in passed down family recipe notebooks not in glamorous food magazines or books.Condensed milk is really beyond pale it makes everything taste better. As for the other key ingredient, the bitter orange liqueur, i used Cointreau and yes Ahhh…mm!! i was in such hurry that instead of using dark chocolate with minimum 70% cocoa solids i ended up using a chocolate with 50% cocoa solids (it did come out very well though). Melt the chocolate carefully in a bowl in the microwave or over a pan of simmering water, when almost melted stir with a rubber spatula to scrape down and to help the last solid bits of chocolate to melt. Take off the heat and let it cool. set aside. In a large bowl pour the condensed milk and 250ml of the double cream, add salt, and whisk till thickened when you lift the beaters, they should leave a trail of ribbons. 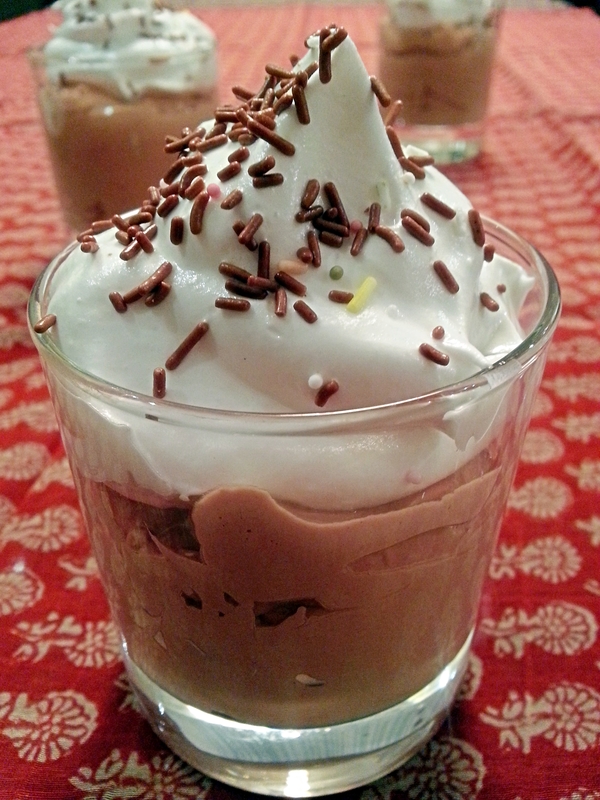 Stir about a third of the whipped cream mixture into slightly cooled melted chocolate, mix thoroughly. Now slowly in 2-3 batches fold the lightened chocolate mixture back into the rest of the whipped cream mixture. Then gently stir in the orange liqueur and the orange juice. When all is combined carefully fill six glasses (around 150ml capacity) to about 1cm below the rim. Place the chocolate mousses into the fridge for 1-2 hours, whip the remaining 250ml double cream until thick but still floppy, before peaks begin to form and put this in the fridge, too. When you are about to serve distribute the cream equally between glasses of chocolate mousse and top these fluffy clouds with sprinkles or if you want orange zest.